Sacre’ Bleu! A Whisky from France? Yep … and it is a mighty fine drinker to boot. C’est la Vie! Jean-Marc Daucourt was born in northern France. His father’s family had been in the distilling business there for years, but Jean-Marc wanted a more diverse education on the subject, so when he came of age, he went to Scotland and Germany to work his apprenticeship in Europe’s finest distilleries. Returning to France, now a master distiller, he acquired and old distilling house near the Cognac appellation and set himself to work. Like any craft, focus is key, and so far Jean-Marc has focused on making one product, and making is very, very well. 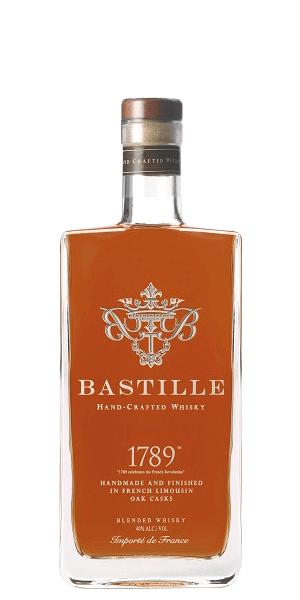 Bastille 1789 Handcrafted French Whisky is all about making a great spirit. They start with a combination of malted barley and wheat for the mash. It is distilled in classic, old-world, copper alembic stills—the same kind traditionally used for cognac and that look like they were plucked out of a medieval alchemist’s workshop. Aging takes between five and seven years in three kinds of casks: French Limousin oak, cherry wood, and acacia. This is a very unique combo for a Whisky of any stripe. All of that hard work yields up a very complex, yet harmonious Whisky that is is just c’est magnifique! It is lush with a chewy/honey/toffee and spice flavor that will rock your next Manhattan cocktail. But do yourself a favor and try it neat, in a snifter. 1789 was the year of the French Revolution, and The Bastille was an infamous prison where, in addition to actual criminals, the corrupt and indulgent French monarchy had imprisoned its political enemies. The French Revolution began with the “storming of The Bastille” as protesters threw open the gates of the prison to release the captives held there. So, the name “Bastille 1789 Whisky” is a statement of rebellion and national pride at the same time. What does Bastille 1789 Handcrafted French Whisky taste like? The Flavor Spiral™ shows the most common flavors that you'll taste in Bastille 1789 Handcrafted French Whisky and gives you a chance to have a taste of it before actually tasting it. Christmas cake, orange marmalade, apricot, and leather … very complex. Medium bodied with flavors of orange zest, and baked dessert breads. Pretty good whisky for a blend. If you like blended whisky, then you’ll like this one. Even if you don’t like blends, it’s worth trying. Kind of sweet, kind of fruity, kind of medicinal. It’s like Canadian whiskey with a splash of brandy. Not bad, not great. The fruity taste does remain on the tongue. Good with friends and California rolls. I had this in a flight at a local whiskey pub which drove me to order a bottle. The pairing in the flight must have been really good because when I got the bottle it tasted NOTHING like my previous experience. I am not much for peated or smoky scotches. This stuff definitely did not live up to my expectations! It was like weak Laphroig or Lagavulin. Ended up giving it away after the third try. I tried to find some redeeming quality to keep it, but just couldn’t. If you like peat and smoke go ahead and give it a try. If not, stay the hell away. I don’t know why this whisky is rated so low. It’s excellent with a light smokiness. The only French whisky I've tried, but it's good. Smooth and tasty and affordable. This is a smoke bomb. The smoke is so overpowering that you can't taste anything else. Bought as a present for the birth of our first son. Awesome! Like drinking velvet, flavorful, and warm without being hot, something a little different from our standby Scotch collections. Very good french whiskey, kind of a niche but it is very good. If you are a Scotch lover, you will love this French Whisky. This is my absolute favorite when not having a Scotch. It is very smooth and flavorful without the harshness and bitterness you find in many others. Perfect with a cigar or by itself, I recommend it neat! Unimpressive and not worth the money.